Retract the papers, Mr. Principal. Yet another case of blatant plagiarism by the vice-chair of Senate! Two Queen's papers on 'Engineering Education' contain substantial text lifted from the work of other researchers without citation. 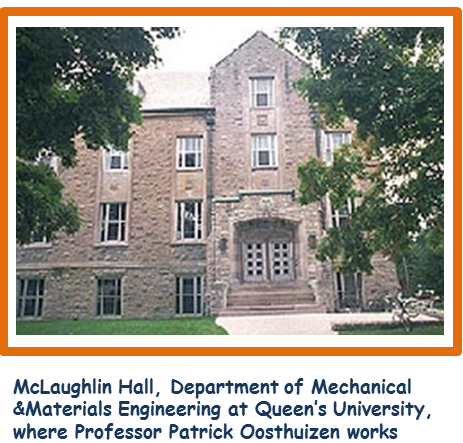 Both papers are written by Professor Patrick Oosthuizen(P.Eng. ), Vice-Chair, ﻿Senate of Queen's University,﻿ and Chair of the ﻿﻿Board of the Faculty of Applied Science . The author argues that students need to be exposed to ethical issues. He also discusses the significance of writing " simply, but effectively". Patrick Oosthuizen, “Using the works of Nevil Shute in engineering education”, World Transactions on Engineering and Technology Education, Volume 5, Number 2, pp. 345-348. (Prof. Zenon J. Pudlowski, ed.-in-Chief).World Transactions on Engineering and Technology Education © 2006 UICEE . Dr. David P. Stern, ‘Nevil Shute's other Career’ - (2002). It seems that the author has pulled material from a number of sources and repackaged them as his own work. Patrick Oosthuizen (2006): “Then Britain itself began arming and Airspeed could stop worrying about sales. It built bombers during the war and was ultimately swallowed up by its competitor de Havilland." David P. Stern, ‘Nevil Shute's other Career’ - (2002): "Then Britain itself began arming and Airspeed could stop worrying about sales; it built bombers during the war and was ultimately swallowed up by its competitor De Haviland." Patrick Oosthuizen (2006): How did Nevil Shute come to write a novel that anticipated the Comet disasters? Many theories have been advanced but perhaps it really is just as Henry Petroski believes, that Shute just followed his engineering instinct, which was very good, and it took him where real life was eventually to take the Comet." John H. Lienhard, 'Engines of Our Ingenuity', Page 228:﻿ "How did Nevil Shute anticipate the Reindeer disaster? Author Henry Petroski's idea isn't dramatic, but it's convincing. He thinks Shute followed his engineering instinct, which was very good, and it took him where real life had eventually taken the Comet." Patrick Oosthuizen (2006): “Moral responsibility requires as much of the individual as business responsibility, and the employer seeking to create progress must, of necessity, accept the duties of both realms of responsibility. On the other hand, the effort as Shute articulates it, carries a spiritual component. Shute acknowledges that technical training encourages, even requires, secular thinking, but argues nonetheless that technology and spirit are not only compatible, but complementary." Fred Erisman: Essay, 1994: “Moral responsibility requires as much of the individual as business responsibility, and the employer seeking to create progress must, of necessity, accept the duties of both realms of responsibility. The federal framework for the responsible conduct of research lists plagiarism as a breach of the rules governing federally funded research. The framework defines ' plagiarism' as " Presenting and using another's published or unpublished work, including theories, concepts, data, source material, methodologies or findings, including graphs and images, as one's own, without appropriate referencing and, if required, without permission."